I hope you have been keeping well since my last message and are having a healthful 2018 so far. I wanted to send you a quick update on what we have been working on in the albertapatients community. 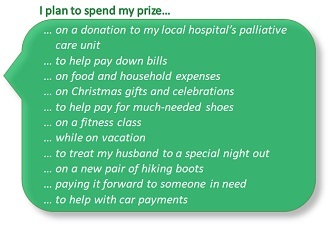 In December, we sent out a survey asking you to prioritize health care matters by importance. We then gathered your feedback and shared it with the AMA’s Board of Directors. The Board was enthusiastic to receive your feedback and was pleased that your health care priorities are well-aligned with many of the initiatives currently being developed by the health care system. Going forward, we will continue to rely upon you for your invaluable feedback. Thank you, as always, for your time and interest in albertapatients.ca. 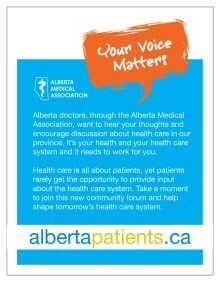 I appreciate your support for improving Alberta’s health care system. Late last year, we asked albertapatients members for their views on four emerging health care topic areas and why these issues are important to patients. Please read on to the Did You Know section (below) for highlights from that research and a link to the full report. Members' views about emerging health care topic areas. Did you know? Members almost unanimously agree that health care integration and information should be a top priority for discussion in albertapatients. 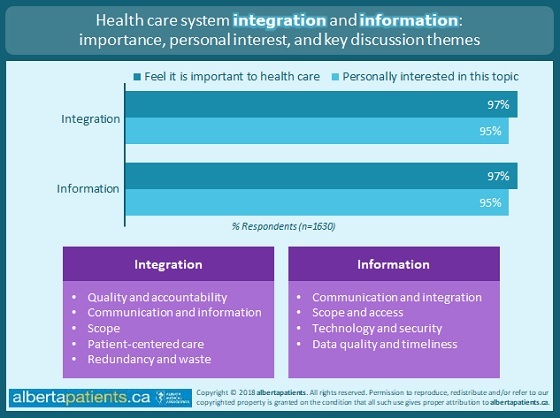 Fully 97% of respondents say that both these topics are important to health care in Alberta, and 95% are personally interested in both topic areas. Communication and information access/sharing are widely regarded as being a key component of integration with considerable appetite for more streamlined communication and information sharing among health care providers and with patients themselves, but also significant concern about the 'rules' around what information is shared, how, when, and with whom. Health care system sustainability is also a high priority for members. Similar to the previous themes, 97% of respondents agree that sustainability is important to health care in Alberta and 93% say it is a topic they are personally interested in. Major themes emerging from discussion around questions, aspects, and issues tying back to sustainability are funding and waste reduction, prevention and education, communication and transparency, and planning and resources. Patients generally agree that physicians should be fairly compensated for their skills and effort, but desire more accountability and transparency. Although fewer albertapatients members express personal interest in physician compensation (75% are interested in this topic), more than 8 in 10 (85%) feel it is important to health care in Alberta. When asked about questions, aspects, and issues that should be discussed, accountability and fairness, recruitment and retention, system abuse and waste, and transparency are the major emerging themes. There is also an appetite for connecting compensation to measures like patient satisfaction and outcomes.